It's interesting to note that the early English colonies were run as businesses rather than countries or colonies. This is reflected in their names such as The Virginia Company, The Massachusetts Bay Company and The Bermuda Company. Charters were given to groups of merchants who were responsible for running these companies in a profitable and politically stable way. They were permitted to make their own laws and international policies, albeit they had to be in line with British foreign policy and law of the time. This is still basically the system effected in Bermuda today. By the late 17th century, King Charles of England felt his authority over the colonies slipping away. He needed to establish a means of securing loyalty to the throne and eventually did this by aboloshing the company charters and placing their rule directly in the hands of the Crown. This sat well with the Bermudians of the day, as they had found the policies of the Bermuda Company had restricted their individual abilities to practice free enterprise. The first effects that this removal of the Bermuda Company's charter had on Bermuda was the appointment of Colonel Richard Coney as Governor. He proved to be unpopular amongst Bermudians who sought to have him removed via a revolution. The revolution was quashed peacefully merely by the arrival of a then famous treasure hunter William Phipps, who persuaded them that Coney could be a valuable ruler. Phipps soon had to return to England, and his support of Governor Coney was continued by one of the first colonial pirates, Bartholemew Sharpe. Bartholomew Sharpe was renown for his battles against the Spanish and the capturing of a top secret Spanish pilot book which gave directions for sailing into the gold laden harbors of Spain's South American ports. Sharpe was commissioned in the British Royal Navy for this act, however he chose to continue plying his trade of piracy, commisioned now by the Governor of Nevis to continue raiding Spanish vessels. Based in Bermuda, he was arrested when a Royal Navy frigate arrived in Bermuda, tried and found not guilty, mostly due to the praise heaped on him by Governor Coney. He was then taken to Nevis for trial, and again was found not guilty, and acquitted of several felonies, piracies, and murder and released for a "fee" (fine) of eight shillings and four pence. Sharpe continued on as one of the most feared colonial pirates, and became infamous and for his beheading of 350 crewmembers of the Spanish galleon "Santa Maria", not the one of Christopher Colombus fame! These times were a period of economic transition for Bermuda. Because of the vastness of the size of Virginia and its tobacco plantations, Bermuda could no longer compete in this area, and looked to the sea as a source of income. Bartholomew Sharpe proved to be an inspiration! In 1678 Bermudian's set sail for the Turk's Islands and set up a salt panning trade. 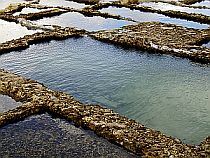 Seawater was pumped into shallow settling ponds, and after evaporation, the remaining salt was harvested. This was six years before the end of the Bermuda Company, and for eight years afterward, they continued in their trading of salt. During these times before refrigeration, salt was a valuable commodity as it was used in preserving meats and fish for long journeys. Their peaceful enterprise came to end in 1692 when an aggressive new Governor of the Turks, Nicholas Trott, a Bermudian himself whose family had migrated there, began levying heavy taxes on the Bermudian salt traders. The Bermudian's protested loudly against this taxation to London, however their pleas were ignored and things became even worse in the early 18th century when overtly anti-Bermudian Governor rose to power, Elias Haskett. Haskett and his cronies were racketeers, and seized and sold Bermudian salt ships. This very nearly led to war between Bermuda and the Bahamas, owners of the Turk's Islands. It did lead to letters of marque, basically liscences to become colonial pirates, being issued to the Bermudians by their government authorizing them to terrorize Bahamian vessels. This was the beginning of the colonial pirates of Bermuda, or privateers. During the escalation of the Spanish War of Succession 1702-1713, Bermudians were forced to stay at home, and consequently lost posession of the Turks Islands in 1706. However a Bermudian privateer by the name of Captain Lewis Middleton returned to recapture them in 1710. Though many Bermudians did stay at home in case of a Spanish invasion during the war, many also went to sea, signing on as crew for British and Dutch privateering vessels commissioned to raid the Spanish fleet. When peace came however, there was little for these men to do, so many of them joined a man by the name of Henry Jennings, who had been hired by the Spanish Government to track down any existing colonial pirates and capture or kill them. Jennings and his men however, being pirates at heart, turned against the Spanish and attacked their salvage camps where the headquarters and storage facilities for salvaged treasure from sunken Spanish ships was located. they escaped and established a base at New Providence, which later became the home base for pirates such as Blackbeard and Calico Jack Rackham. From this base these colonial pirates attacked shipping of all nations and it was decided by Governor Benjamin bennet of bermuda to offer these pirates amnesty in the hope that it would reduce their numbers. Perhaps tired of their violent and dangerous lifestyle or softened by the lure of an easy lifestyle now that they were rich, many followed Jennings back to Bermuda where they were pardoned and used their pirate booty to establish legitimate businesses. One of the businesses started by these ex-privateers was supplying existing colonial pirates with salt or tobacco. The small and speedy Bermudian sloops would sail off for the Turks Islands where the white crewmembers generally would disembark to remain in the Turks for up to a year plying the salt trade. The captain and mostly black crew remaining would then put out to sea, fishing for turtle, diving and salvaging sunken treasure or trading with pirates. They would eventually head to Curacao, St.Thomas in the now U.S. Virgin Islands, or the French islands in the Caribbean where they were always well recieved. Here they would sell their cargo, and even their ship for the right price! Bermudian vessels were prized by colonial pirates because of their speed, and most times the vessel was sold easily. If the vessel was not sold, they returned to the Turks islands, picked up the remaining crew, and sailed on to North America where they would sell the salt and other commodities traded for in the Caribbean. This business was very lucrative as well as adventurous, and many of the early colonial pirates of bermuda became and died wealthy and influential men. Some of their families retain this wealth and influence in Bermuda up until this day. Read About The Individual Adventures Of Bermudian Colonial Pirates Here.